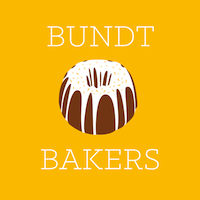 I am with #BundtBakers today and hosting!! I came up with a cool theme I thought, of Hot Chocolate for this month’s bundts. What do you put in your hot chocolate? Does it get spiked, is it white or milk chocolate, do you make it from scratch, add in shaved chocolate, cinnamon, marshmallows, candy canes? The list can go on and on. I came to a White Hot Chocolate Peppermint Bundt as my choice for today and it turned out pretty and delicious!! I made this bundt a bit different than I normally do and went more for a pound cake than the usual lighter cake I make. My daughter is on her second piece already for a after school treat, she is loving it. 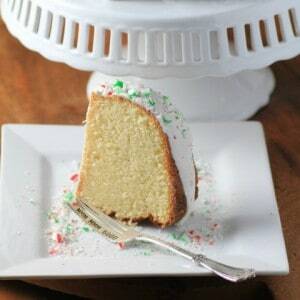 The cake is very dense and buttery and stood up nicely to the addition of white hot chocolate and peppermint. 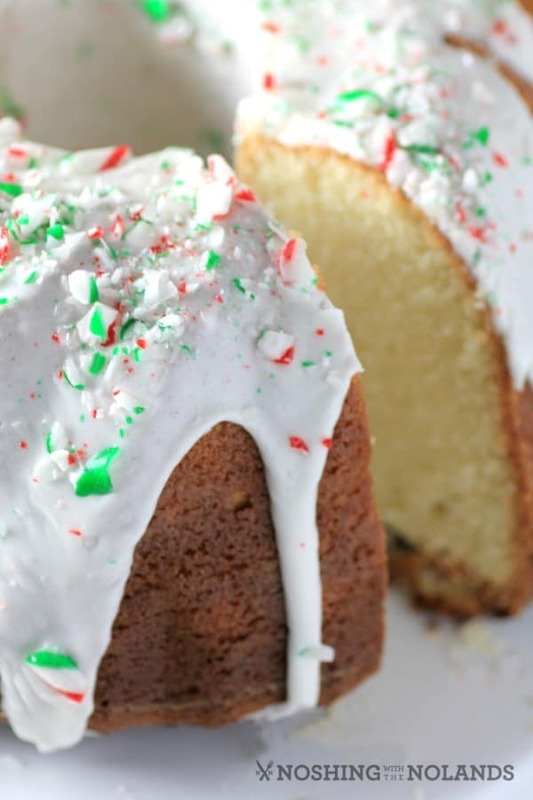 The icing is light and if you really like peppermint you can add some to the icing too. I left it with just the white hot chocolate as it is subtle and you get the addition of the peppermint with the candy canes on top! 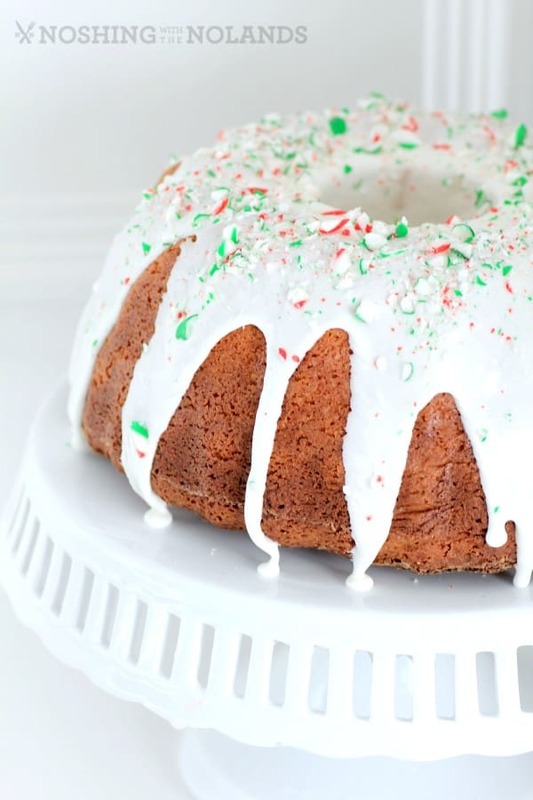 This would make a great celebration bundt for the holidays. Of course it can be made ahead of time and it is also easily portable. Everyone young and old would love this. It has a wonderfully buttery finish with hints of peppermint and white hot chocolate, neither being too over powering. Grab your bundt pan and whip up this pretty bundt, you and who ever you share with will be very happy!! 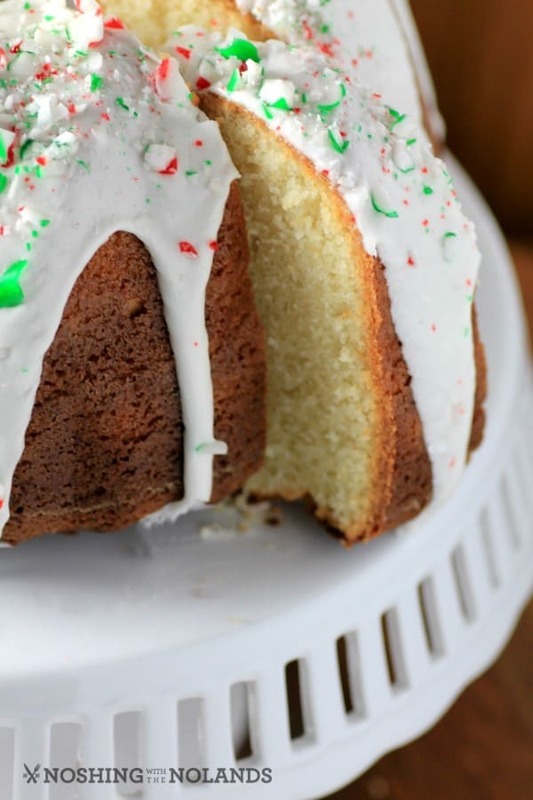 A buttery pound cake transformed to a white hot chocolate and peppermint dream in the form of a bundt and just in time for the holidays! Preheat oven to 325F. Prepare a bundt pan by brushing with butter and flouring, set aside. In the bowl of a standup mixer cream the butter, add the sugar and continue to beat until fluffy. Add the eggs, one at a time and mix well after each addition. Add the vanilla and peppermint extracts. In a seperate large bowl whisk together the flour, baking powder, and salt. Add in the hot chocolate and mix well. Add to the butter mixture and alternate with the cream. Starting and ending with the flour. Pour into prepared pan. Bake for 1 hour or until cake tester comes out clean. Cool in pan for 10 min. and then remove to a cooling rack to completely cool. For the icing, mix together the powdered sugar with the hot chocolate mix and the meringue powder. Add in 3 Tbsp. cream and the peppermint extract if using. Beat with an electric blender adding in more cream to desired consistency. Whip the icing until slightly fluffy. 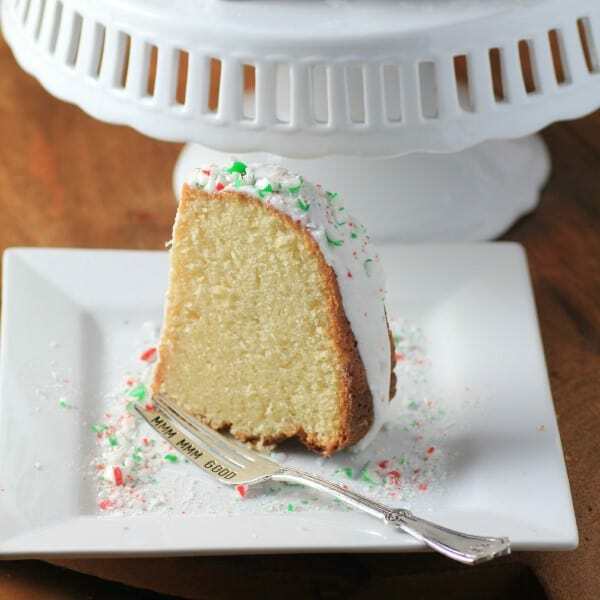 Pour over the cooled cake and sprinkle the top with candy canes. Save extra crushed candy cane for the plate. Here are all the wonderful bakers that have decided to join me this month in celebrating hot chocolate!! 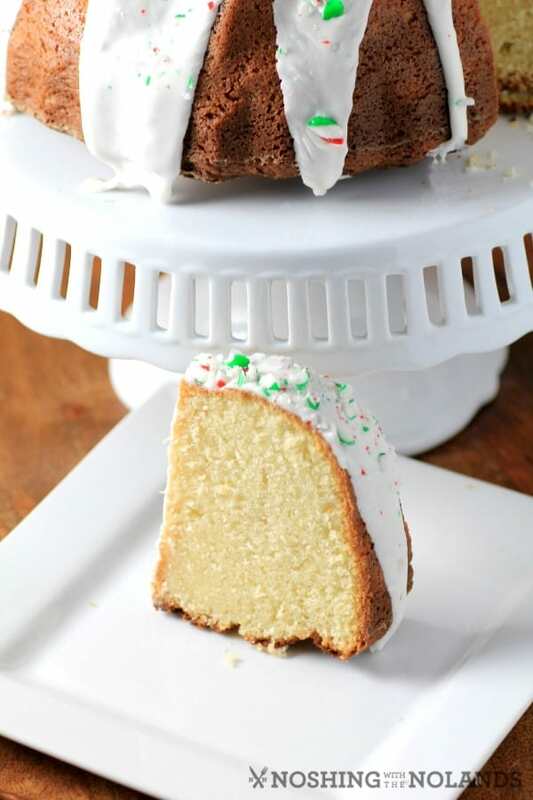 Such a great idea for a Bundt cake! It’s so striking and perfect for winter. It looks like the snow that’s unfortunately sure to come. Thank you Laura and yes, we already have that snow!! Gorgeous cake Tara! I love the combo of flavours of course, and the fact that is dense, I really like tight crumb ones! Love the holiday colors. Thanks for hosting today Tara! Thank you so much Paula, always lovely to have you here! Tara, your cake is great. I would love you to stop by Food on Friday: Cakes over at Carole’s Chatter to add this to the cake collection! Cheers! I have never had white hot chocolate, but that may soon change. So pretty and festive! This is PERFECT for the holidays, Tara! I love peppermint in my hot chocolate, in fact, I love peppermint anything. Beautiful Bundt! Thanks so much for hosting this month! This is one beautiful bundt. 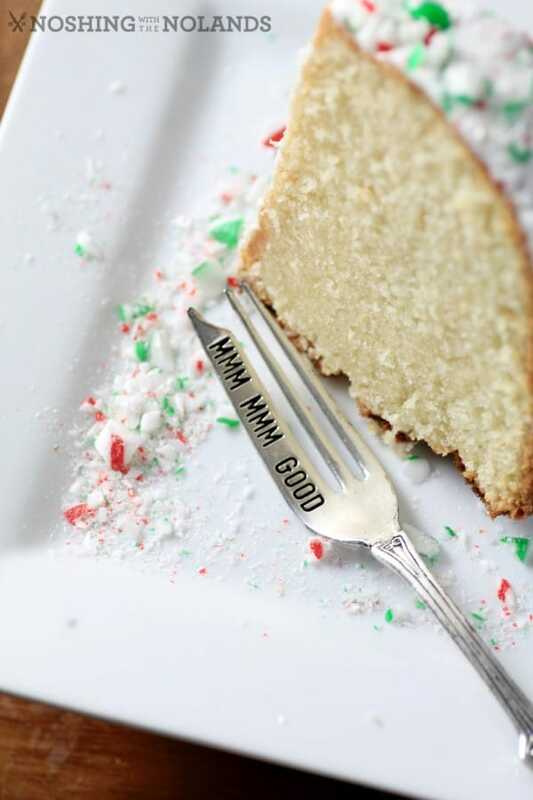 Perfect addition to the Holiday table. This cake is stunning and I promise you I will make it. I love that you resisted adding any milk or dark chocolate. Yum!!! I love the pictures, it´s like if we were on christmas time yet. oh my goodness, Tara…look at your bundt! it’s looks like “winter in wonderland”-just gorgeous! thanks so much for hosting, you did a wonderful job. This is one beautiful Bundt, Tara! I love peppermint, especially during the holidays and especially in my hot chocolate! I love how dense and delicious this cake looks. Thanks so much for hosting and coming up with this fun theme! Deliciously moist cake you have it there. This cake looks and sounds amazing!! This looks fab! Those crushed candy canes are such a simple way of decorating it, but so effective! So festive and so delicious. This cake is just drop dead gorgeous. What a beautiful cake! My mouth is watering just thinking about the gorgeous flavour combination you’ve got going on too! Enjoy!! Happy Birthday to the lucky recipient!